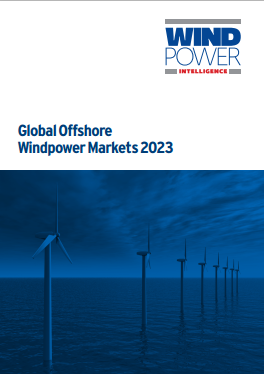 Global Offshore Windpower Markets 2023 provides strategic market intelligence and long-term market forecasts. Future planning issues, policy targets and investment opportunities are also analysed nationally and by region to complete one of the most comprehensive reports on the Global offshore market ever assembled. 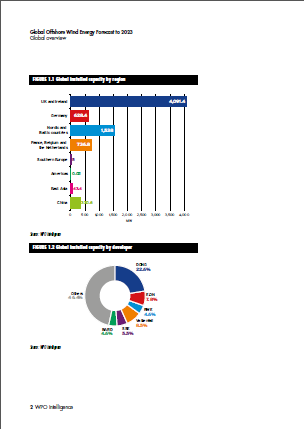 Detailed analysis of the globaoffshore wind power industry. The ‘Global Offshore Wind Energy Forecast to 2023’ combines research by a global team of expert researchers with insight from the proprietary WPO Intelligence database of individual offshore wind farms – both in existence and in the pipeline. It applies robust data-mining techniques to identify trends among regions, countries and companies. It also weaves in a separate data set on turbine technology, which enables a refined analysis of technological trends. 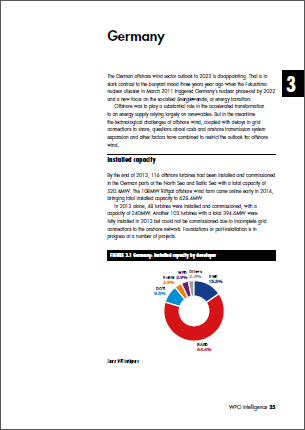 Information for the graphics and tables in this report is drawn exclusively from WPO Intelligence data. For data analysis, we used the database taken on. Data were only drawn from ‘active’ projects – those categorised as being either operational (online) or ‘in progress’ and estimated to come online by 2023. A total 302 projects fit these criteria. We excluded projects long inactive (classi?ed as ‘dormant/on hold’) or cancelled by developers. Analysis reflects developers’ exact share of projects where known. When such data is unavailable, shares are divided equally. It is important to distinguish between our analysis of the offshore wind project pipeline and our market forecast. Any individual ‘in progress’ project in our pipeline analysis may or may not in fact go online. Also, discussion of pipeline activity is limited to what is known about projects – for example, what companies are contracted to supply foundations or at what water depths projects will be constructed. This permits precise analysis based on hard data. But understanding of the pipeline will naturally evolve as new information emerges. Our forecast of offshore wind capacity to 2023 is based on a combination of existing forecasts by reputable organisations, The WPO Intelligence pipeline of projects and an assessment of individual countries’ policies and offshore wind or renewable energy targets, when available. 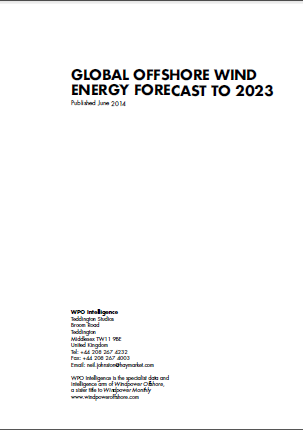 The ‘Global Offshore Wind Energy Forecast to 2023’ combines research by a global team of expert researchers with insight from the WPO Intelligence database of individual offshore wind farms – both in existence and in the pipeline. It applies robust data-mining techniques to identify trends among regions, countries and companies. It also weaves in a separate data set on turbine technology, which enables a refined analysis of technological trends. Information for the graphics and tables in this report is drawn exclusively from WPO Intelligence data. 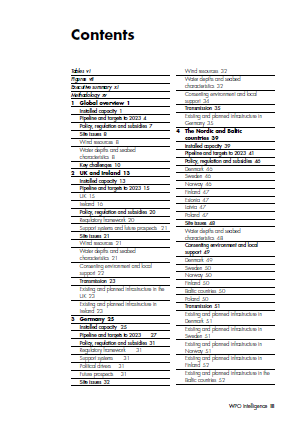 For data analysis, we used a snapshot of the database taken on 16 May 2014. Information we may have learned after that date is not re?ected in the report. Data were only drawn from ‘active’ projects – those categorised as being either operational (online) or ‘in progress’ and estimated to come online by 2023. A total 302 projects fit these criteria. We excluded projects long inactive (classi?ed as ‘dormant/on hold’) or cancelled by developers. Analysis reflects developers’ exact share of projects where known. When such data is unavailable, shares are divided equally.It is important to distinguish between our analysis of the offshore wind project pipeline and our market forecast. Our forecast of offshore wind capacity to 2023 is based on a combination of existing forecasts by reputable organisations, especially BTM’s ‘World Market Update 2013’, published by Navigant Consulting, the WPO Intelligence pipeline of projects and an assessment of individual countries’ policies and offshore wind or renewable energy targets, when available.